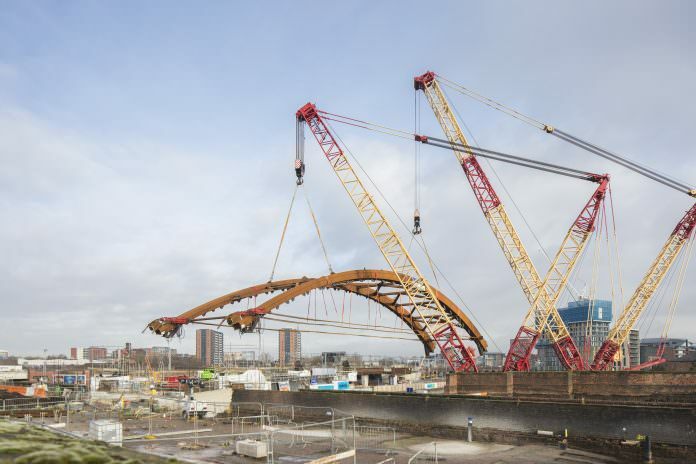 The largest crane in the UK was used to hoist a 600-tonne bridge into place on the Ordsall Chord today. 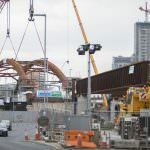 The scheme will link all three of Manchester’s main railway stations – Piccadilly, Oxford Road and Victoria – for the first time. 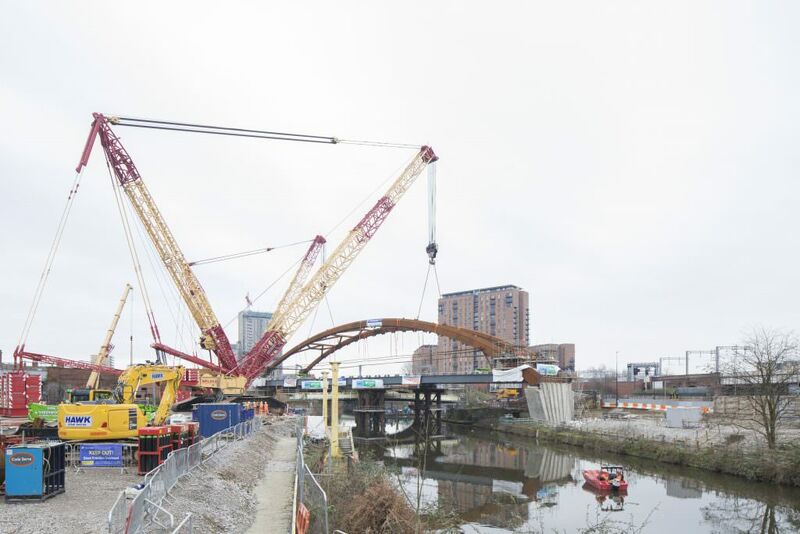 Ordsall Chord forms part of the Great North Rail project, which aims to reduce railway congestion by 25 per cent in Manchester, reducing journey times and enable faster, more frequent services to run through the city to and from other major economic centres in the north. 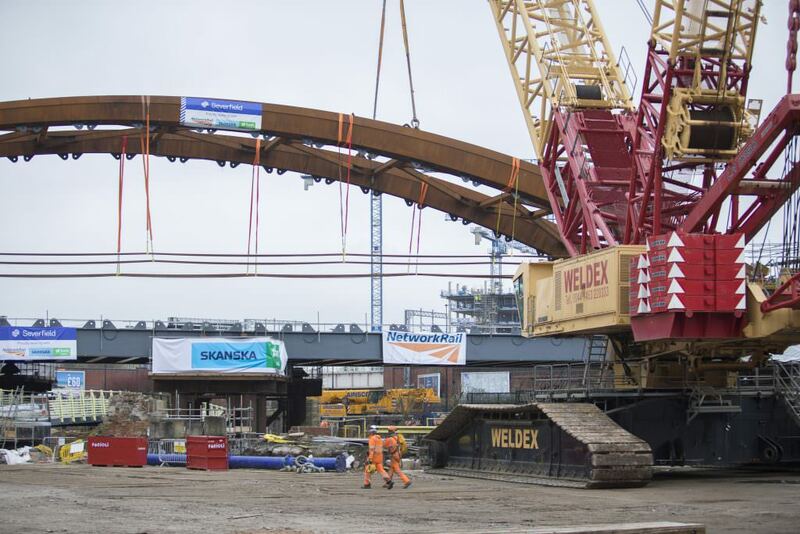 The new bridge, made up of two huge steel arches, is the first of its kind in the UK. 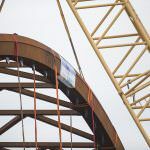 Designed and constructed in Greater Manchester, it uses inclined hangers, which cross each other at least twice, instead of vertical hangers. This allows for a more elegant design that is thinner and uses less material. It is close to the spot where, in September 1830, George Stephenson opened the Liverpool-Manchester line. 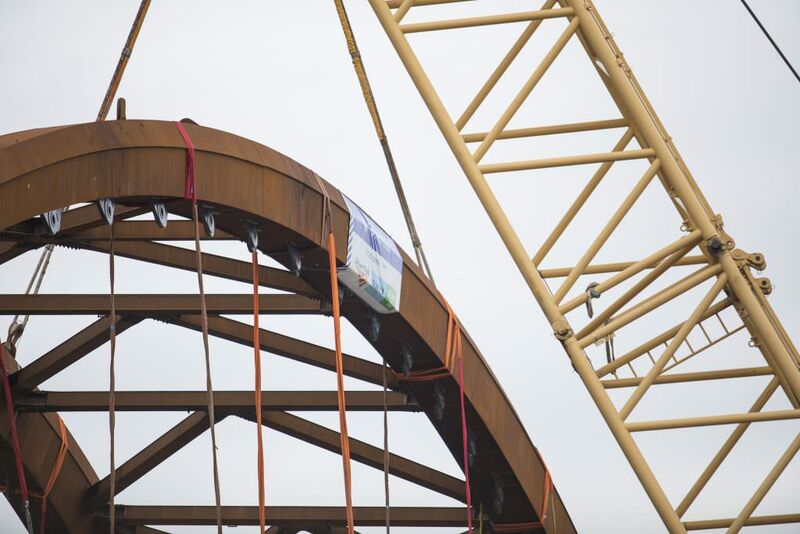 His bridge, which is still in place, makes a suitable backdrop for the new design. 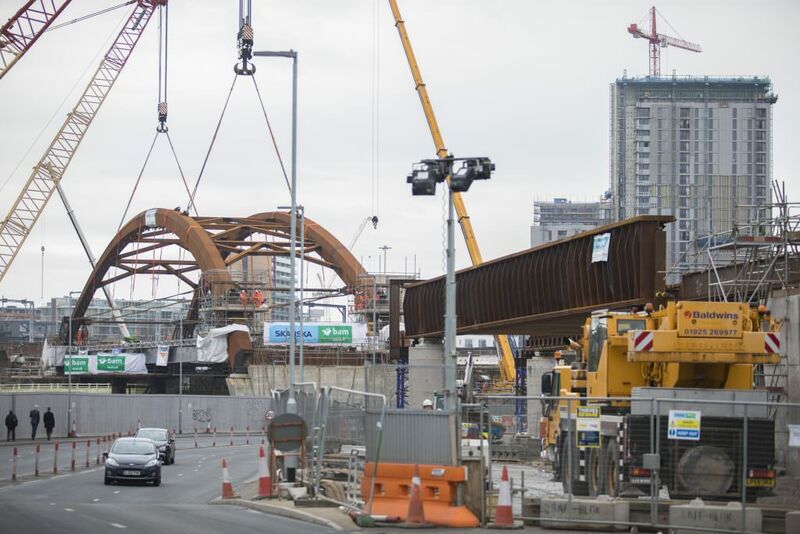 Peter Jenkins, transport architect director at the BDP Manchester studio, commented: “The BDP team has designed, with the engineers from WSP, Aecom and Mott Macdonald, an 89-metre single-span network arch bridge, the second-longest in the world to carry twin heavy-rail tracks. 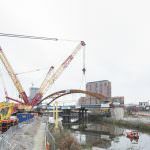 “The arches elegantly taper to a fine point towards their ends as they approach George Stephenson’s original 1830 bridge over the Irwell. I still have my original sketch of the bridge concept from when BDP started work on this exciting and challenging project over five years ago. Rail Minister Paul Maynard was enthusiastic about the new development. “I’m delighted this crucial step has been completed successfully,” he said. 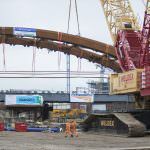 “The Ordsall Chord is a key part of the government’s £1bn-plus investment in upgrading the rail infrastructure across the North of England.